Receive a FREE Neuropathy E-Book when you sign-up for our mailing list. Damage to the nerves and energy production of the body is a growing problem. Both, r-alpha lipoic acid and acetyl L-carnitine are key nutritional ingredients to addressing these problems. The “R” form is considered the biologically active form, identical to that produced by the body. Unlike other forms of lipoic acid, RLA is bioavailable and more stable in the body. RHP® Alpha Lipoic Acid & Acetyl L-Carnitine is a targeted wellness solution – just for you. * Combines two antioxidant nutrients in one convenient formula. * Contains 30 servings (60 Capsules) per bottle. * Exceptional quality at an extraordinary value. ALA and ALC can help to maintain blood pressure levels already within the normal range. R-Alpha Lipoic Acid – An Antioxidant Powerhouse! Alpha-lipoic acid is an antioxidant that is made by the body and is found in every cell, where it helps turn glucose into energy. Antioxidants attack “free-radicals”, waste products created when the body turns food (including glucose) into energy. Free-radicals cause harmful chemical reactions that can damage cells in the body while antioxidants, get rid of free-radicals which may reduce or help prevent some of the damage they cause. While certain antioxidants work only in water (such as vitamin C) or fatty tissues (such as vitamin E), alpha-lipoic acid being both fat- and water-soluble, allows it to work throughout the body without being affected by one of the other exclusively..
As antioxidants attack free-radicals, the body uses them up, however evidence suggests alpha-lipoic acid may help regenerate these other antioxidants and make them active again. hence, a powerhouse antioxidant. Alpha lipioc acid comes in two forms. R and S. When a product states Alpha lipoic acid, it’s usually a combination of these two forms. R-alpha lipoic acid is the form normally found in the body. Studies indicate that supplements containing only R-lipoic acid appear to be better absorbed than supplements containing both R-lipoic acid and S-lipoic acid, with results showing twice as much ALA appearing in the bloodstream after an oral dose of R-Lipoic acid. Studies also indicate that alpha lipoic acid has an ability to kill free-radicals which may help people who have nerve pain, burning, itching, tingling, and numbness in the arms and legs from nerve damage. Because R-Alpha Lipoic acid is the form best utilized by the body, Real Health Products provides R-Alpha lipoic acid in the Nerve & Energy Booster, which is to say, its most stable, absorbable form. Acetyl L-Carnitine is a type of carnitine which is a substance that helps the body turn fat into energy. Your body makes carnitine in the liver and kidneys and stores it in the skeletal muscles, heart, and brain. Acetyl L-carnitine acts as an antioxidant. High blood sugar levels damage nerves in the body, especially the arms, legs, and feet, causing pain and numbness. Some small preliminary studies suggest acetyl L-carnitine may help reduce pain and improve feeling in affected nerves. It is also possible that acetyl L-carnitine can help nerves regenerate. 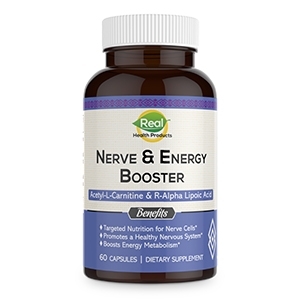 Real Health Products is pleased to be able to provide you with a nutritional supplement called the RHP® Nerve & Energy Booster which contains acetyl L-carnitine and R-alpha lipoic acid. Studies showed that taking acetyl L-carnitine and R-alpha lipoic acid together resulted in even greater improvements than either ingredient alone.